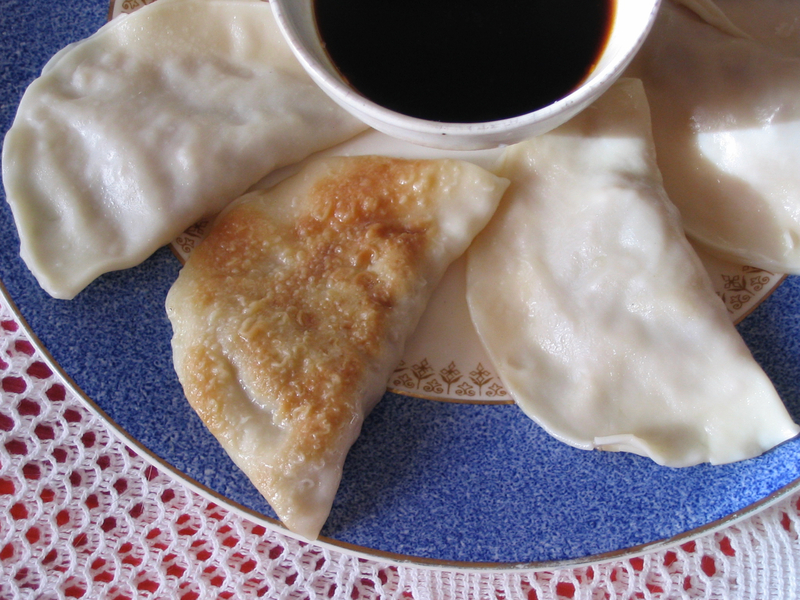 Also known as pot stickers, these Japanese dumplings are easy to prepare and make an impressive entrée or snack. In this version, the star ingredient is shitake mushroom but that can easily be replaced by other vegetables, prawns or meat. I’ve created other versions using green cabbage (raw and finely sliced) and even leftover roasted cauliflower. If creating your own flavour combination, please remember to include all the other flavouring ingredients. The white, round gyoza wrappers are cheap and readily available from Asian groceries. Any leftover wrappers can be frozen. Adventurous cooks who need a gluten-free option, can try making their own. Have fun creating your favourite gyoza combination. A note on quantities: you can only fit a teaspoon of the final mix in a single wrapper otherwise it won’t seal, so a little goes a long way. The amount described is a good as a starter for 2 to 4 people. Scale up the quantities for a larger batch. In a mini food processer quickly grind all the vegetables and herbs, add a teaspoon of tamari and whizz again. Add another teaspoon if needed for a moist but not runny consistency. The mix should hold together between your fingers. Taste it, add toasted sesame oil or more ginger etc as desired. Take a wrapper in one hand, with some water on your finger run it around the inside edge of the wrapper (this will help it seal). Place a teaspoon of the mixture (you’ll know from the first one if this is too much or too little) in the middle of the wrapper, fold in half and gently press the edges together. This can just be a plain edge, or pinching or pleat them between thumb and forefinger if you want to be fancy. The main thing is the ingredients are sealed and won’t leak. 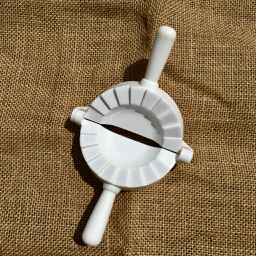 Asian grocery stores also sell cheap plastic dumpling gadgets to make the job easier. Just make sure you get one that fits the width of your wrappers. Place finished dumplings on a plate or tray without touching. If you are making a big batch, or preparing them ahead of time, place a damp tea towel over the prepared gyoza to stop from drying out. Heat a wide fry pan and add some vegetable oil. (I like raw sesame oil.) 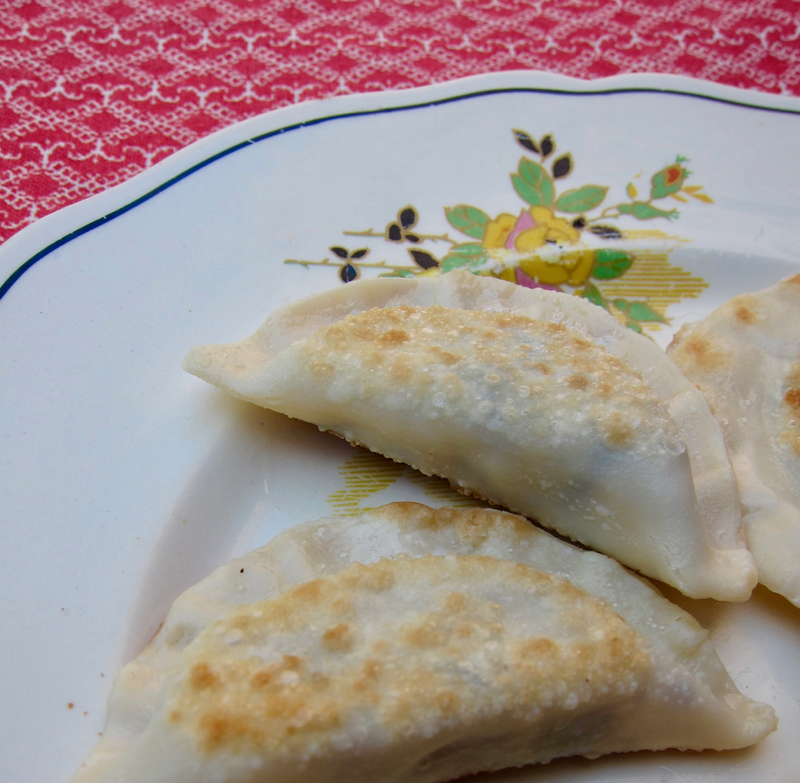 Place gyoza in circles from the outside inwards, close together without over lapping. My Le Creuset pan takes up to 14 gyoza at a time. Cook on medium-high heat for about 3 minutes until the bottoms are golden brown. Then add 1/3 – 1/2 cup of water and cover with a lid. Turn the heat down to low – medium and simmer for about 3 – 4 minutes until the tops of the wrappers are becoming translucent. If any water is left by that time, take the lid off and continue cooking until it has evaporated. Some traditional dumplings are deep or shallow fried on both sides, others are steamed. I like this fry/stem method, creating wondrous pillows of goodness, soft on top and a little crunchy on the bottom. Serve straight from the pan, dip in the sauce and devour. A few drops of chilli oil (from Asian stores, this stuff is hot, so add it a drop or two at a time and taste), or a half birds eye chilli, finely sliced. Stir and serve in a bowl. Unlike some pastas, gyoza wrappers don’t contain eggs, so are ideal for making vegan ravioli as well as Asian dumplings. This recipe is vegan and if can be gluten-free. For more tasty, healthful meal ideas, explore the recipe archive.